If you keep up with Inspire you've probably noticed that we use Expression Engine for many of our non-Rails sites. Viget.com and all 5 of our blogs are built on Expression Engine, as are client projects such as PBS Digital TV, Sodexo Esteem Pass and RollStream. Expression Engine is a very powerful content management system with a lot of great features and functionality, but it isn't the most intuitive CMS to jump into. When I first came to Viget I had no knowledge of EE and found it pretty confusing until I really wrapped my head around it. I learned the basics pretty quickly thanks to some great online tutorials from BoyInk and a lot of help from my fellow designers, but a beginner book would have been helpful. Web tutorials are great but I like to do lots of highlighting and underlining. I'm one of those tree-killers that still prints things out to take notes on. 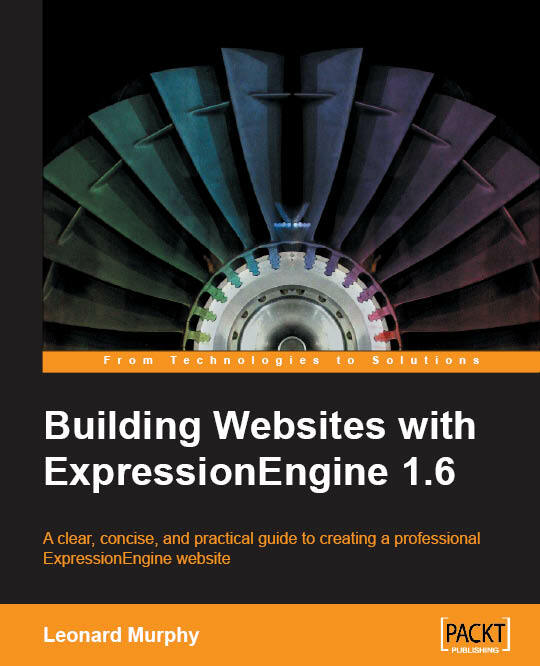 Recently, Packt Publishing sent me a copy of Building Websites with ExpressionEngine 1.6 by Leonard Murphey. It's the only Expression Engine book on Amazon right now, perhaps because the EE user base is so much smaller than blog platforms like WordPress. I was really hoping it would help make sense of some bigger questions I have about EE, like sorting out the many different ways to organize and build your site structure. Unfortunately for me, neither Leonard nor the Expression Engine team offer much insight about that. Everyone seems to have their own way of doing it, and even here at Viget our strategies vary from site to site. While it didn't answer my theory-based questions, it offers a good introduction for a true beginner and showed me to quite a few capabilities I hadn't explored. The book takes an exercise-based approach, walking you through the steps you might take to build a full site in EE. The site you will build includes static pages, a blog, a calendar, a members-only area, and a simple store. Topics include installation, the templating system, using weblogs, and working with modules such as members, discussion forums, and simple e-commerce with PayPal. The exercises are very detailed and even walk you through adding CSS to style it - something I found distracting, but beginners might find helpful. Despite the fact that it's written for absolute beginners, I did learn some new things. The in-depth member management information was useful, as was the explanation about how to build a calendar and a simple photo gallery. Lots of screenshots and example code make the 370+ pages less overwhelming than they look. I wish it would have gone into more depth about Embeds and URL segments, as this is something incredibly important to understand if you're going to make good use of Expression Engine and it feels like they are glossed over. It could also use a diagram of some sort explaining the relationship between Weblogs, Templates, Template Groups and Field Groups. In fact, if anyone out there knows of one I'd hang it up over my desk as a reminder! If you know a little HTML/CSS but you are brand new to EE, this book will help get you started down the right path. If you've been using it for a while you probably won't get a ton of new info out of it - still, worth browsing if you can get your hands on it. Wondering if it's for you? Packt Publishing was nice enough to provide a sample chapter for Inspire readers. So if you're interested in seeing what the book has to offer, download the PDF extract.